Growing up in Boulder is an experience I wouldn't trade for the world. One amazingly unique feature about downtown and the surrounding community is the emphasis on supporting local businesses. 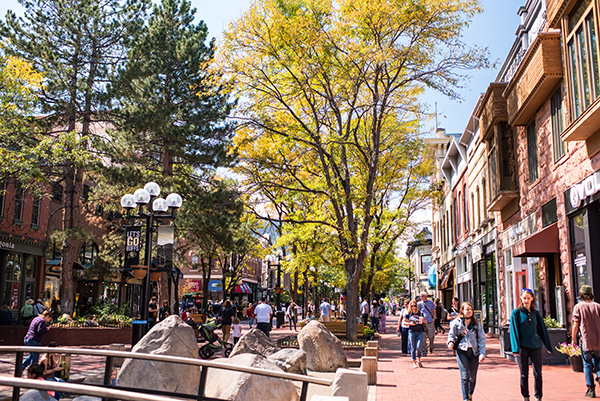 Downtown Boulder has an abundance of locally owned shops and restaurants that have established a loyal customer base and have helped encourage the idea of shopping and dining locally. The term “Love the Local” has been coined to inspire residents and visitors to shop and dine locally. Supporting local businesses is a cause near and dear to my heart. Growing up in Boulder I was a regular at the Farmers Market; the play structures on the Pearl Street Mall were my kingdom, the brass animal sculptures were my pets; and the kids menus at the local restaurants were my jam. Growing up being taught to eat locally, shop locally and participate in the local community made my love and appreciation for local fare grow even more. It has become one of my passions and I hope to one day open my own store on the mall to keep the legacy of locally owned businesses going. In turn I want to highlight businesses downtown that inspire me and the rest of the community to keep shopping, dining and striving to love and support locally owned establishments. I’ve been going to The Cup since I was in high school. This locally owned and operated coffee shop has the best energetic and welcoming vibe. Whether I’m doing work or meeting a friend to catch up over coffee The Cup will always be my go to downtown Boulder coffee shop! Salt is my family and my favorite restaurant downtown and we love to gather here on special occasions and connect over delicious, locally sourced food. I am blown away by the effort that Salt makes to keep their menu filled with seasonal ingredients from local producers, just one more reason to support Salt and keep lovin’ the local! One of my first jobs downtown, was at family owned retailer, Savvy on Pearl. It was here I was truly inspired by the passion to keep downtown local. With the effort, thought and care the Dahl family put into the business it demonstrated to me that they really appreciate and know what makes downtown special is the local aspect that creates a unique atmosphere unlike any other place. Showing support for local businesses has a tremendous positive effect on the local economy and the quality of life in Boulder. Sales taxes help support parks, libraries, trails and basic services provided by the city of Boulder. In turn Boulder continues to be a vibrant, eclectic and unique community. When you love the local by shopping and dining locally you encourage, invest and support your community, it allows room for the community to blossom and grow into something special. So keep in mind whenever you’re downtown next it is important to try and spend your money at local businesses to keep Boulder and downtown a one-of-a-kind community. Mark your calendars for Small Business Saturday on November 24th, the perfect day to come out and support local businesses this holiday season!